Vintage - Elizabethan Fine Bone China, by Taylor and Kent. Pattern #374 (noted on the Back Stamp), or same as #T&K420. EACHTea Cup and Saucer Duo is PRICED AS A TWO PIECE SET. CLICK ON THE QUANTITY OF DUO SETS YOU WANT TO PURCHASE, Circa 1960's, Includes up to $5.00 Shipping Credit. Vintage - Elizabethan Fine Bone China, by Taylor and Kent. Pattern #374 (noted on the Back Stamp), or same as #T&K420. 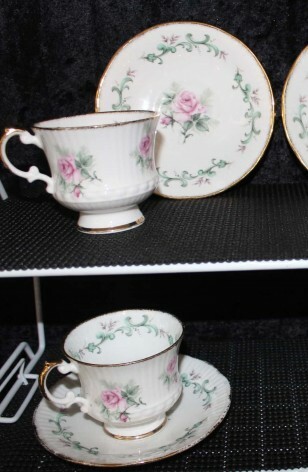 EACH Tea Cup and Saucer Duo is PRICED AS A TWO PIECE SET. CLICK THE QUANITY OF DUO SETS YOU WANT TO PURCHASE. Circa 1960's.